The existence of homosexuals is now starting to develop in Jakarta. It can easily be found in various social networking media about their existence whether in terms of performing self-disclosure or even in seeking partner. 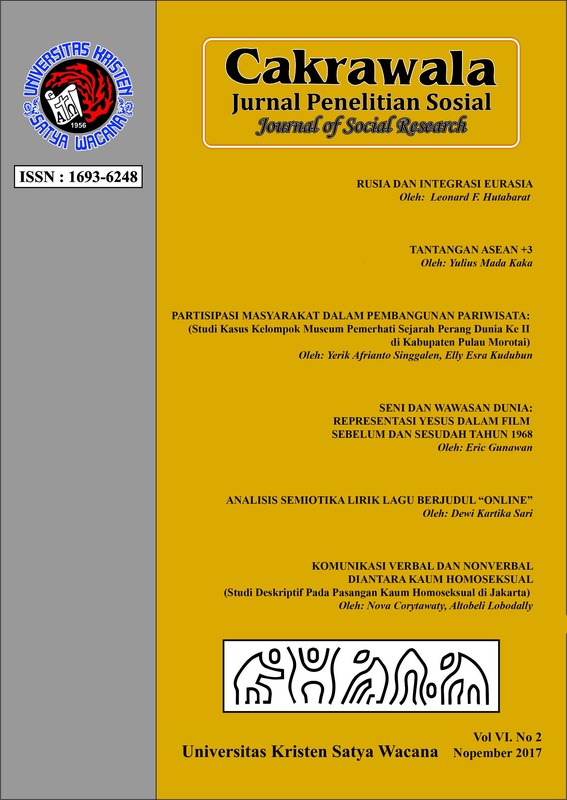 The purposes of this study are to knowing the process of how verbal and nonverbally communications used by the homosexuals especially who already pairing such as the language they use, how to know each other, appearance and to find out the communication patterns use by the homosexuals in their self disclosure. Theory used in this research is social penetration and self-disclosure. In this study research uses qualitative methods refers to the study of descriptive. Research informants in this study are three couple, range of relationship are 3 months, 2 years and 3 years (living together). The informants were taken from different areas in Jakarta. After doing researches, the research obtains the following results: duration relationship, an agreed role, condition and situation, economic and ages factors, the influence of foreign ideologies and personal identification affect a verbal and nonverbal communication used by homosexuals with their partners. Asmani, J. M. (2009). Awas! Bahaya Homoseks Mengintai Anak-anak Kita. Jakarta: Pustaka Al Mawardi. Barker, L. dan Gaut, D. (2010). Communication 8th Edition. Massachussets: Allyn and Bacon. Hardjana, Agus. (2003). Komunikasi intrapersonal & Komunikasi Interpersonal. Yogyakarta: Penerbit Kanisius. Kriyantono, R. (2012). Teknik Praktis Media, Public Relations, Advertising, Komunikasi Organisasi, Komunikasi Pemasaran. Jakarta: Kencana Prenada Media. Morissan. (2010). Psikologi Komunikasi. Bogor: Ghalia Indonesia. Morissan dan Wardhany. (2009). Teori Komunikasi: Tentang Komunikator, Pesan, Percakapan dan Hubungan. Bogor: Ghalia Indonesia. Moleong, L.J. (2011). Metode Penelitian Kualitatif. Bandung: PT Remaja Rosdakarya. Mulyana, D. (2010). Ilmu Komunikasi Suatu Pengantar. Bandung: PT Remaja Rosdakarya. Oetomo, D. (2004). Memberi Suara Pada Yang Bisu. Yogyakarta: Galang Press.